Darwin’s hypothesis that species evolve into other species by small additions over a long time has proven false. Lloyd Pye has shown that After 150 years of Darwinians’ searching, no missing links have been found to show a transition from one species to another. The strained, false hypothesis that we evolved from Australopithecines (Lucy, et. al.) or other Terran hominoids has been conclusively disproven. Nor has ANY species here ever evolved into another. Each species does indeed adapt in size and special anatomies to changing environments, but never into another species. This sudden introduction of species, however, in no way validates the silly creationist idea that Earth was created in six days 6, 000 years ago. All of the species on Earth were introduced here, whole and complete. Each life form appears suddenly, with no link whatsoever to prior species, in the fossil record. When, about 4 billion years ago, the Earth cooled enough to support two related by distinct single-cell bacteria–prokaryotes and archaebacteria–whose genetic sequences were half identical and half different, four billion years ago. Prokaryotes and archaeyotes lacked enclosed cell nucleii; their genetic material just floated in their single cells. Then, suddenly, 2 billion years ago, bacteria with their genetic material enclosed in membrane-bound nucleii, the eukaroyotes appeared. They did not, and could not–despite desperate attempts by evolutionists to do so–evolve from the prokayotes and/or archaeyotes. Even the simplest forms of life here didn’t follow the Darwinian hypothesis of slow development. Eukaryotes did not evolve from simpler forms. Nor did any subsequent species evolve from any earlier ones. All of these bacteria are so complex, none of their innards could possibly be gradually assembled into a living species. 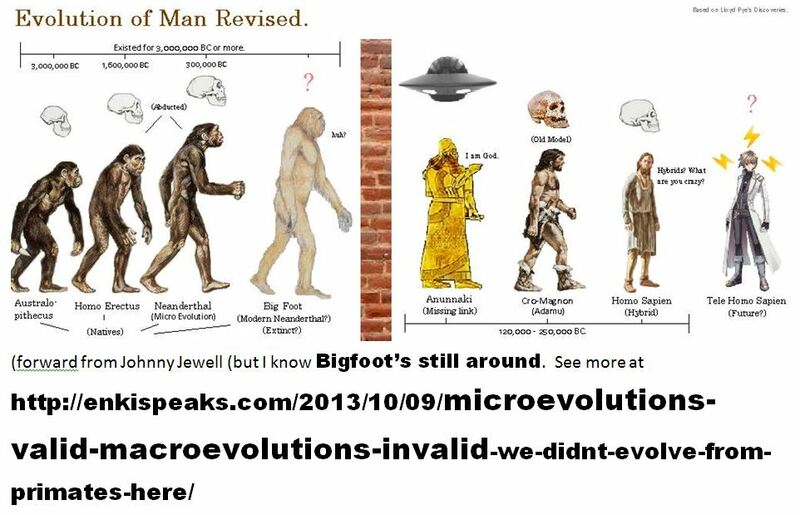 The bacteria did exhibit microevolution, however. Some (methanogens adapted to oxygen-use, some (halophiles) adapted to life without salt, some (thermophiles) adapted to extreme heat; but these species, despite their micro-adaptations, never evolved into structures that could be called new species. One billion years ago a multicellular plant, algae, suddenly, with no connection to the bacteria, appeared. 600 million years ago, again with no precursors or evolution such as the erroneous Darwinian hypothesis postulates, corals and tiny worm- and seaweed-like creatures which were neither plants nor animals appeared in the fossil record and remained until most of them died during one of several extinction events that’ve hit Earth. All the life forms up to this time have freed oxygen in the seas and rivers and created a platform that could support the great Cambrian explosion of lifeforms on Earth, 530 million years ago. “Within 10 billion years (.oo2% of the 3.47 billion years of bacterial life preceding it) all major groups of complex animal life–the body designs (phyla) within the animal kingdom appeared in large numbers–all 26 animal phyla, the entire spectrum of invertebrate life–sponges, brachipods, arthropods, mollusks–along with spineless chorsdates all come in. Darwin’s disproved theory said the record would show continuous species extinction as better-adapted species won their habitats. This also is false; 99% of all species became extinct, not from habitat competition, but from asteroid or comet strikes, massive volcano eruptions, or drastic climate change that trashes their ecological niches. Plants and animals show up abruptly and die out, usually, in a million years. 245 million years ago, the Permian Extinction killed off half of Earth’s marine invertebrates and 90% of other species. 65 million years ago, The Cretaceous extinction wiped out most of the dinosaurs and almost all other life on Earth. Darwin’s theory, which academics must tout to keep their jobs, holds that all upright creatures–hominids–that move on their hind appendages evolved from one form that evolved in the Miocene, 20 million years ago. “The most recent Mioscene ape fossel dated at 8.5 million years ago. The first fully-upright hominids appear 3.5 million years ago.” Between these two events, separated by 5 million years, despite 140 years of search by Darwinians, have yielded absolutely no intermediate “missing links”; the links are missing because they were never here. 300, 000 years ago, Enki, Chief Scientist of the goldmining expedition of modern Homo Sapiens from the planet Nibiru to Earth went to the Great Rift Valley (southeast Africa) to study Homo Erectus (ancestor of modern Bigfoot), again, a sudden introduction to Earth, as key to adaptations Nibirans would need to create adapted Homo Sapien slaves–us– who could thrive on Earth and labor for the expedition. Erectus reasoned, freed animals from traps. He communicated telepathically rather than speak. Enki and his sister, the expedition’s Chief Medical Officer and Enki’s son Ningishzidda, created us, adding a few Erectus genes, some copper, clay, and Homo Sapien mitochrondriatal DNA from Ninmah to adapt us for them. Pye shows overwhelming evidence for gene splicing to account for Homo Sapiens having two less chromosomes than Homonoids that already walked the Earth, and Homo Sapiens have more than 4,000 genetic defects from chemical gene-splicing of Anunnaki genes onto Homo Erectus genes. Hominids, such as chimps and gorillas, which had millions of years to evolve on Earth, have only a few hundred of these defects. Pye (Sitchin and Tellinger too) presents conclusive evidence for genetic engineering 300,000 to 200,000 years ago to create us hybrid slaves of the Anunnaki Goldmining Expedition to Earth. Some 300,000 years ago, Enki, Chief Scientist and Goldmining Operations Chief of the Nibiran Mining Expedition to Earth, went to the Great Rift Valley (southeast Africa) to direct mining operations there and study an intelligent, fire-using primate, Homo Erectus. Enki and his 900 or so Expedition Personnel were full-on Homo Sapiens Sapiens–pretty much like us, but twelve-feet or more tall.